Last issue we found that the water/air intercooling system, as initially installed, had some major problems. In short, the system was unable to be fully filled with water, and the Johnson Controls pump cavitated badly. On both the heat exchanger and the front-mount radiator, the location of the water fittings meant that after the system was filled with water, the top half of the units remained full of air, not water. A way of bleeding out this air during filling needed to be found. One approach would have been to drill holes on the upper tanks and then weld on small threaded spuds that could take bleed screws. But with the heat exchanger already powder-coated, I was reluctant to do this as it would destroy the powder-coating. I could also have drilled and tapped holes in the alloy for bleed fittings – but the success or failure of that approach would depend a lot on the wall thickness of aluminium. In the end I chose to take a different approach. Five millimetre rivnuts were inserted in holes drilled in the alloy upper tanks of both the front radiator and the underbonnet heat exchanger. 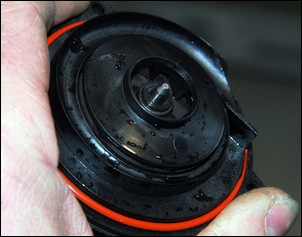 The rivnuts were sealed into place with liquid gasket. A 5mm screw (with rubber washer) was then inserted into each rivnut. Undo the screws, and the air can be bled out. It’s a bit fiddly (access to the front radiator bleed is tight) but at least the two heat exchangers can now be fully filled with coolant. But what about that cavitating pump? Even during bench testing, the Johnson Controls pump had been reluctant to pick up water. It needs to work at the bottom of the system (ie it cannot draw up water) but when configured in this way on test, any restriction in flow would cause it to stop flowing water – and not resume until it was again carefully primed. In the car, despite being placed at the bottom of the system, it cavitated badly at normal running voltage - presumably because it couldn’t draw enough water. I therefore decided to replace this pump with another, better quality design. 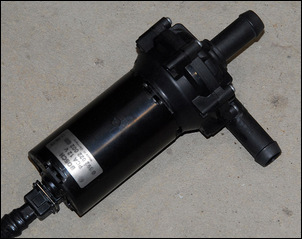 The new pump was a Bosch 0 392 022 002 design used in OE (and many aftermarket) water/air intercooler applications. I was pretty excited when the new pump arrived from the US. I mounted it, applied power - and then heard the same noise of cavitation that I'd got with the Johnson Controls pump! I checked for restrictions or blockages and could find none. I was just stumped: how could two pumps - including a good quality one specifically designed for water/air intercooling systems – both be cavitating? Surely it could only be a problem with my system? I then removed the complete water/air intercooling system from the car and mounted it on the floor, with the relative levels of each component correct. But no matter what I did, as soon as the voltage was turned up to running-car voltages, the pump cavitated. It was OK at say 8V, but obviously then the flow was a lot lower too. I then used a low-pressure garden hose to assess the flow of the underbonnet heat exchanger and front mount radiator, tested out of the system. Both flowed water with very little restriction – so that wasn’t the problem. I then remembered an old Subaru Liberty RS (Legacy outside of Australia) water/intercooler water pump that I have. I fished it out, took off the pump head to ensure the motor still turned, reassembled it and then put it in the system. This pump, that seems to operate at a much slower speed but with a substantially larger pumping head, doesn't cavitate. It's rated at a zero restriction flow of 15 litres a minute and it draws 2.5 amps. After the Johnson and Bosch pumps cavitated, and before I found the Subaru pump, I decided to revise my water plumbing to give better flow. I initially replaced all the long and tight hose runs with steel tubing. 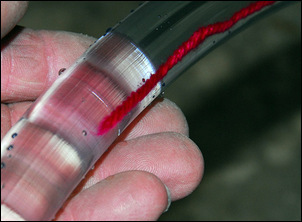 I formed this tubing – ¾ inch and with a 1.2mm wall – into the required shapes using a bench-mounted hand tube bender. Making long and complex shaped pipes in this way was very time consuming and rather difficult, but it potentially gave much better water flow over the rubber hose. However, after I’d made two sections of the new plumbing, I was unhappy with it. Why? Firstly, if hard-mounted to the body, the steel would be much more likely to crack than rubber hose. That meant that every mount would need to be rubber-bushed. Finally, while the hand bender had enough capability to form the required bends, it also didn’t do as neat a job as I’d have wished. So I went back to rubber hose. 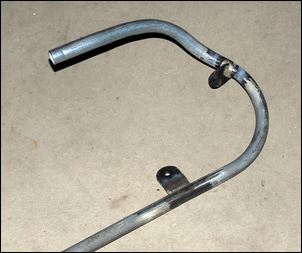 I’d used straight hose for most of the previous version of the system, bending it around corners as required. On these bends it had closed up a little – but I’d not thought this a problem as there was still plenty of cross-sectional area. But maybe it had been an issue? Using many moulded pre-formed rubber bends – as already being used in some locations in the system – would reduce hose restriction over bending straight hose, but for every one of these pre-formed bends that I inserted, I need two hose joiners and four clamps. Since the system has around four or five tight bends, that would greatly increase the opportunity for leaks to occur (try 16 or 20 clamps!). I then decided to use straight hose, making springs (from galvanised steel fencing wire) that would slip over the hose and so prevent its closing up (ie going oval in cross-section). But again I wasn’t happy with the end result. I then looked online and found Unicoils, commercially produced springs (with an added strip) made in stainless steel and designed for just my application – to stop hoses closing up on bends. 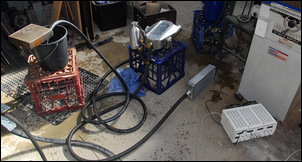 In the end, the water plumbing uses two moulded pre-shaped hoses, about 4 metres of straight hose, and three Unicoils. 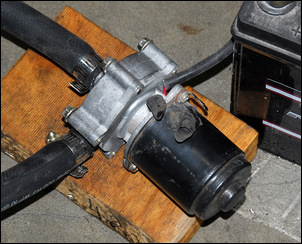 With the Subaru pump happily humming (humming, rather than ‘gobble–gobble’ cavitating), I wondered how to measure its system flow, and to work out over what voltage range it could be speed-controlled. 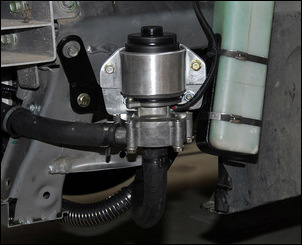 As stated, the Subaru pump is factory rated at 15 litres a minute (less than the Bosch pump that has a zero-restriction spec of 32 litres/minute – but in my system, the Bosch pump could barely pump anything!) but how much water was actually flowing in my system? Taking this approach, I’d measured a flow at 13.8V of 18 litres a minute. But I now realise that such testing is useless – when installed in a circulating system, as opposed to pumping from one bucket to another, the pump’s behaviour was altered. After all, when tested with the buckets, it didn’t cavitate at all! I now think the only accurate way to test the flow would be to install an inline flow meter – and I don’t have one. But what about the range of voltages over which the pump could be speed-controlled? I need this information so I can have the pump just ticking over at low engine loads – moving water around, but only quite slowly. I wracked my brains for a way of testing this, then came up with a very simple but effective approach. I bought a short length of clear plastic hose of the same 19mm internal diameter as the heater hose being used for the water plumbing. I set the entire system up on the workshop floor, using the clear hose for one part of the plumbing. I then inserted a length of brightly coloured wool in the clear hose, with the wool tethered at one end. When the system was flowing water, the end of the woollen thread fluttered in the water flow. I then used a string of 5 watt, 1 ohm resistors to gradually reduce pump voltage until the woollen thread no longer fluttered – indicative of the water flow having stopped. In fact, at a pump supply voltage of 5V, the water was still flowing around the system, but only just. As the flow reduced, the fluttering speed of the woollen thread also slowed, so by close observation, it was very clear how much water was flowing at low voltages compared with full battery voltage. 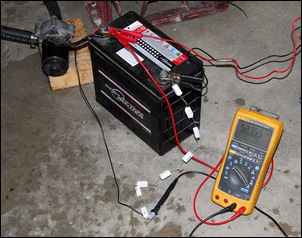 From this I concluded that the pump works well, tested in the closed system, in the range of 6 – 13.8V. In all my years of playing with cars, I’ve never had a dud Bosch product. So why did the Bosch pump work so poorly compared with the Subaru pump? I took off the pump covers to reveal the impellers of each. 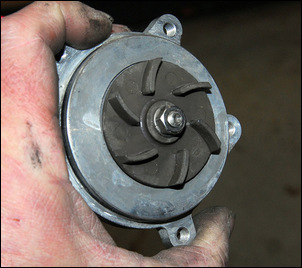 The Subaru pump’s impeller uses a cast alloy vane with six vanes, very similar to an engine water pump. It works a bit like a curved paddle wheel. 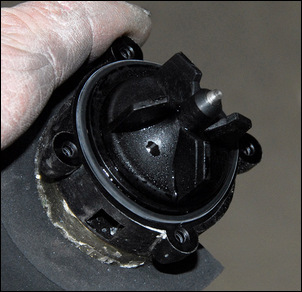 The Bosch impeller is plastic, using an enclosed centrifugal design where water is drawn in at the eye and then pushed out through an increasing diameter exit – rather like a turbo compressor. Clearly, a spinning ‘paddle wheel’ works better in this application than a ‘turbo compressor’! By this stage I was quite intrigued, so I pulled the end off the Johnson Controls pump as well. It uses a paddle wheel approach – but with just four straight blades. Clearly, a paddle wheel with a large number of curved blades works best of all! 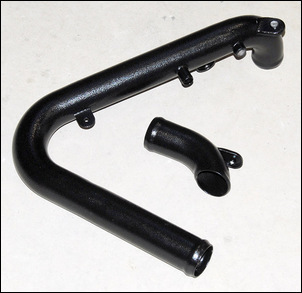 The air plumbing that connects the turbo, heat exchanger and the throttle body uses 2 inch (50mm) steel exhaust tube. Silicone adaptor couplers are used to connect the 2-inch tubes to the 2.5 inch (63mm) heat exchanger end tank fittings. Thankfully, all this plumbing worked without problems! 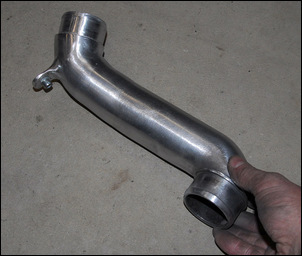 From the turbo compressor outlet, a single short 90-degree steel mandrel bend connects to the heat exchanger. (This tube is the one on the right in this pic.) 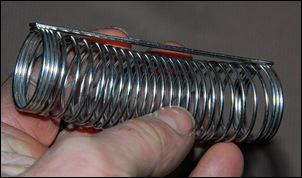 It was a priority that the heat exchanger be positioned so that a single continuous bend – rather than a tight cut-and-shut bend - could be used to make this turbo-to-heat-exchanger connection. 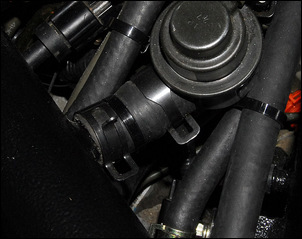 The tightness of this bend required that a 45-degree bend silicone coupler be used on the turbo exit, rather than a straight piece of silicone hose. On the other side of the heat exchanger, a fabricated steel tube takes the air to the standard throttle body. This tube (left in the pic) was made twice. It was tricky to make because it incorporates 125-degree and 90-degree mandrel bends, and two short straight lengths of tube. When finished, it looks easy, but using pre-formed bends (rather than having a bender on the workshop floor to make minor adjustments) meant that all the angles needed to be just right. Furthermore, welding the tubes together while still giving neat internal and external finishes was challenging. On the first iteration, I MIG’d the tubes together and then externally ground back the welds. However, the penetration of the MIG bead into the pipe was uneven – and at times was too great for best flow. On the second iteration, I gas fusion welded the tubes together, an approach that gave an even – and small – penetration into the pipe. All welds were made where the tube was straight – rather than on bends where the outer wall thickness is reduced. 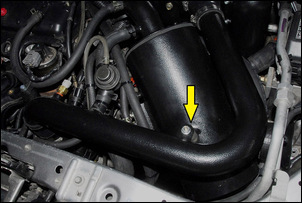 Positioned on this tube are also the fittings for the blow-off valve air return and the intake air temperature sensor. These fittings were brazed into place. 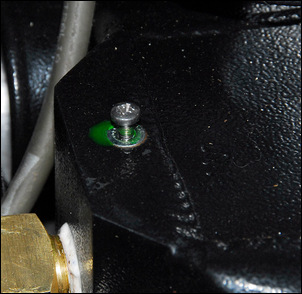 Note that small diameter steel beaded fittings suitable for brazing can be gained by cutting the ends off steel plumbing used for vacuum (and sometimes fuel lines) on other cars. 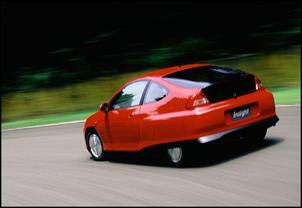 Finally, not shown previously in this series is the airbox-to-turbo intake duct. The intake pipe needs a very tight bend prior to turbo (the bit nearest to my hand in pic) and so I made this intake from the cast alloy intake pipe used on a Nissan, cut into three pieces and then welded back to together in the shape to suit the new application. The lug is for a clamp that holds the main engine wiring loom in place. Getting the water/air intercooler system built and working correctly proved to be a major challenge. However, the pump now circulates water near silently and without cavitation, and the system can be effectively bled of air.